(CNN) -- Sen. Christopher Dodd announced Friday that he has an early form of prostate cancer, but he said the prognosis is good and he is going to be fine. 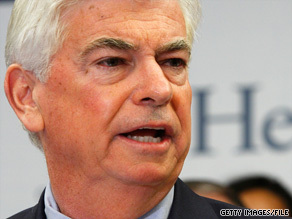 Sen. Christopher Dodd, D-Connecticut, will undergo surgery for prostate cancer in August. "I'm very confident that we're going to come out of this well," the senator from Connecticut said in a news conference in Hartford with his wife, Jackie Clegg Dodd. Dodd, 65, said he was diagnosed in June after an annual physical and had decided Thursday night to undergo surgery after the Senate adjourns for its recess next week. "I'm running for re-election," he said, referring to next year. "Now I'll be a little leaner, and a little meaner, but I'm running." The five-term Democratic senator said he kept the diagnosis quiet until recently, not even telling some members of his family -- including his sister, who died earlier this month from lung cancer, and his good friend Sen. Edward Kennedy, who is fighting brain cancer. Kennedy, a fellow Democrat from Massachusetts, told him, "I can beat mine, you can beat yours," Dodd said. Dodd, is chairman of the Senate Banking Committee. He also is the second-ranking Democrat on the Health, Education, Labor and Pensions Committee and has played a major role in the recent debate on health care while Kennedy, the committee's chairman, has been absent because of his cancer. Dodd's wife said she and the couple's two daughters will be ready to "patch" Dodd up after the surgery to "get you out there again." According to the American Cancer Society, prostate cancer ranks behind only skin cancer as the most common type of cancer found in American men. The organization estimated that more than 192,000 new cases of prostate cancer will be diagnosed in the United States this year. Dodd, who drew criticism in Connecticut when he moved his family to Iowa while he ran unsuccessfully for president last year, is facing a Senate ethics committee investigation over favorable mortgage rates he received under the Countrywide VIP program. He says he did not receive special rates. CNN's Ted Barrett, Brianna Keilar and Mark Preston contributed to this report.